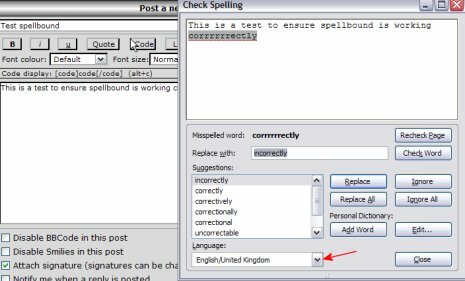 Spellbound is a useful tool that you can add to FireFox which allows you to spell check web forms such as forum posts that you make. Problems with Firefox v1.5 ? First of all if you had a previous version of Spellbound installed on an older version of FF then you need to uninstall this from your FF extensions. You will need to allow the site security preferences. Drag the icon to your toolbar. The first time you use Spellbound you will need to select the dictionary that you installed. Thanks to the guys at mozillaZine in particular Robert S. for his development of this version.